Conducting a valid, legal, and proper origin and cause investigation is the first step in working towards a criminal investigation in an arson cause. It is also important in the investigation of accidental fires so future fires and injuries may be prevented. 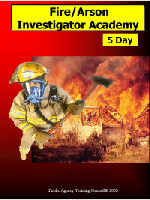 This course will cover state of the art investigation practices for the new and not so new fire investigator. 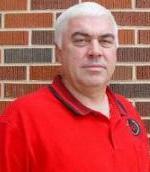 Upon completion of this course the student will have the necessary tools to become a professional fire investigator. The training if followed will assist and prepare the investigator for the challenges they may face in both criminal and civil investigations and court settings. Upon completion of this course the student shall be able to inspect and evaluate the fire scene to determine the area and/or point of origin, source of ignition, materials first ignited and the act or activity that brought the ignition source and materials together. The necessary tools and equipment to perform the investigations will also be listed and the usage of each discussed. The student will be able to prepare diagrams of and take photographs of the scene and utilize several forms of field notes necessary to compile the final report. The student will be able to identify, collect and preserve evidence recovered at the fire scene using the proper physical and legal procedures to retain the usefulness of the evidence in court proceedings. The student will be able to conduct interviews to obtain usable information in the assistance of determining the origin and cause of the fire and in preparing the final report. Information will be provided on techniques for conducting legal interrogations and obtaining usable confessions that will withstand the challenges of the courtroom and legal system. The student will receive training in conducting all post incident investigation processes beyond the fire scene. Including the usage of public records, data searches, and other financial records needed in a criminal and/or civil investigation. The course will provide information that will prepare the student for making presentations in legal proceedings, and in the preparation of reports that will be usable for criminal prosecution and meet department requirements.